Boom! No, that’s not the sound of a kick drum – it’s the sound of the analog drum machine getting friendlier and cheaper the same way analog monosynths have. 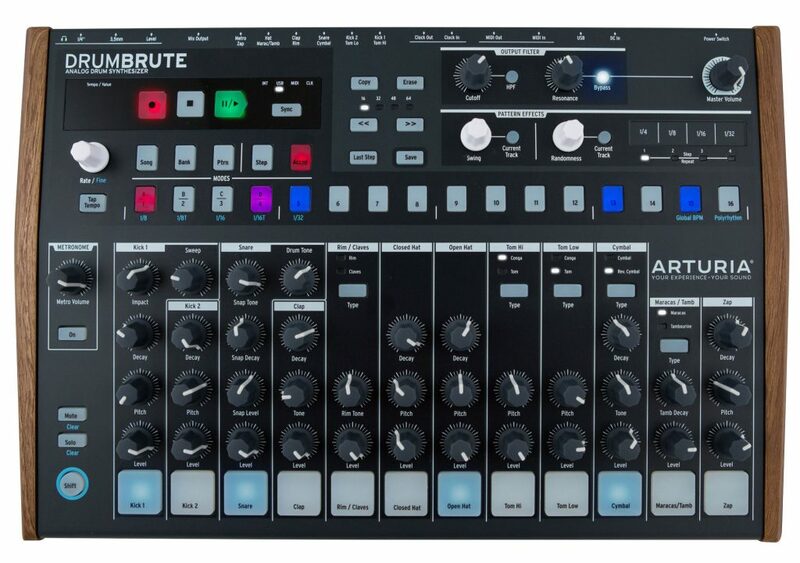 Arturia’s DrumBrute is US$499 (449€), and it’s loaded with hands-on sound controls and extra features. At that price and with all this stuff to play with on the front panel, this is guaranteed big news. Now, the fact that it’s “analog” I’m sure will mean fodder on forums for people to bash certain recent digital offerings. But that’s of course not the point. It’s a matter of whether an instrument sounds good, and whether you get the kind of control over the sound that makes it fun to play. And on a drum machine, it’s also increasingly whether sequencing and other production features make a satisfying package. Love them or not, the Brute has always had loads of personality, so I’m already intrigued by the availability of a drum machine in the line. Still more promising, it seems the folks at Arturia have given us lots of goodies in the box. zap, cymbal, and (interesting) a dedicated reverse cymbal. And each of those has loads of parameters onboard, as well. Two-mode Steiner-Parker filter on the main out. 64 steps per sequence, up to 64 sequences, live programming. Swing, Randomness, Step Repeat, Roller, Looper. Lots of connectivity/sync: MIDI, Clock, 1PPS, 2PPQ, DIN24, and DIN48, for connecting to anything, basically analog or digital, vintage or new, modular or desktop. I’d like to bite my tongue, but of course I have to compare to the TR-09 from Roland. Again, those forum kids are likely to complain that the TR-09 is digital – but that’s not really the issue, as the thing sounds terrific (and it sounds like a 909, which this won’t). But what’s blatantly obvious looking at the DrumBrute is that it’s made in 2016. It’s got pads and performance features we’ve come to expect (since even looking back to the 1980s, we’ve all seen MPCs). It has more hands-on controls of the sounds – and presumably a greater sonic range, for anyone bored with the 909. Here’s the thing. I don’t think the TR-09 is competition for the DrumBrute, and I don’t think the DrumBrute is competition for the TR-09. People who want 909 sounds will still turn to the TR-09. And even though the TR-09 does far less, to some, that’s going to be a selling point – it’s a simpler instrument dedicated to doing one thing that a lot of people want. On the other hand, for people looking to get as much bang for the buck as they can, the DrumBrute is going to be naturally appealing, because it does so much. The real competition for the DrumBrute to me is stuff like the MFB instruments – and devices costing a lot more. 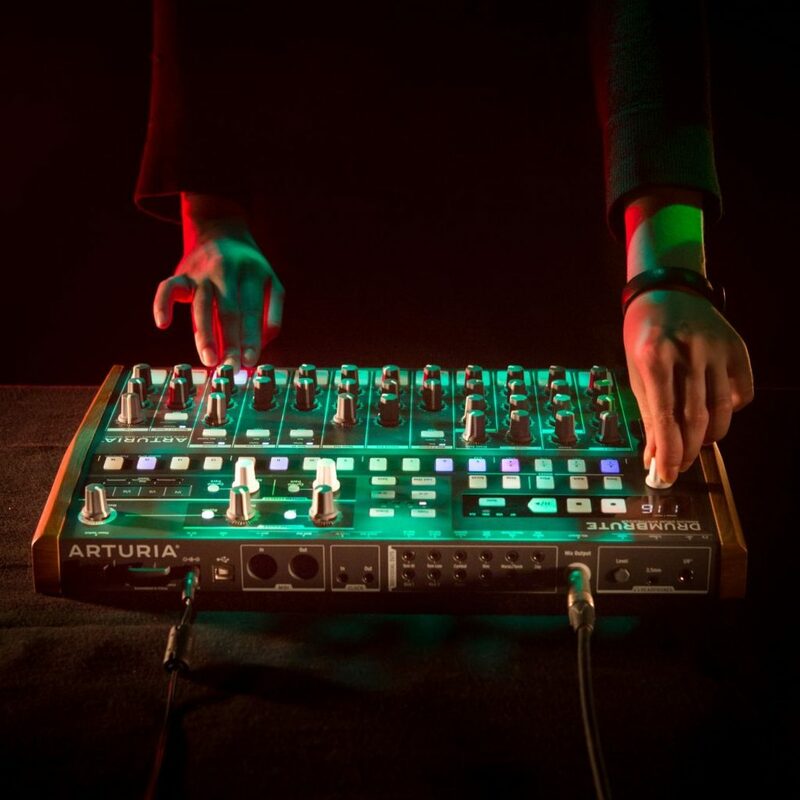 And I think it’s incredible what Arturia have done for this market, not only making analog instruments affordable, but connected ones – with onboard CV and with lots of controls. And most importantly, the DrumBrute isn’t a reissue of anything, or a clone of anything. It’s at last a serious new entry for entry-level drum machines. And that means it’s worth forming an opinion about. Hmm, now … let’s see, DrumBrute + TB-03 + MeeBlip and I can really leave my laptop at home. Stay tuned. Shipping soon, with dealers due to have stock in November. Stay tuned for a review. Bonus video. Here with … a lot of distortion. Excellent.